Our leans went 2-1 with a push last night, hitting the Islanders/Penguins First Period Under 1.5 (scoreless) and Ducks in regulation (Anaheim beat Winnipeg 3-1), and losing the Stars Team Total Under 2.5 as the Sharks’ struggles continued with a 6-1 loss in Dallas. It’s a busy Saturday in the NHL with 12 games on the schedule, including a couple of afternoon starts. Always nice to have a couple of games on the tube in the afternoon to whet your appetite for the evening’s main course. And the evening slate has a few matchups with massive post-season implications, including the Bruins visiting the Islanders, the Senators travelling to Montreal and the Leafs visiting Buffalo. It will also be interesting to see if the Sharks can snap out of their funk in Nashville, which has historically been a very difficult place for them to play and should be even harder on the second night of a back to back. Alright, let’s get to the NHL tips for today. Good luck if you’re on any of these games with us! The Hurricanes are quietly one of the hottest teams in the NHL, going 6-0-3 in their last 9 games. After consistently outshooting their opponents much of the season without being rewarded on the scoreboard, the puck is finally going in these days for the Canes, who have put up 3 goals or more in 5 straight games and 7 of their last 9. That should spell trouble for a Devils team that was awful defensively earlier in the year (we exploited it with a lot of Team Total Overs against them when they allowed 4+ goals in something like 10 straight games, don’t exactly remember) and seems to have regressed to those defensive struggles again lately. New Jersey has given up 3+ goals in 5 of its last 7 games and 4+ goals in 4 of 6. Those numbers don’t exactly suggest they can slow down the hot Carolina offence tonight. We also considered the Over 5 -110 to allow us at least a push if both teams score 2 goals tonight, but aren’t quite sure the Devils can pull their weight offensively. New Jersey’s been held to 2 regulation time goals or less in 7 of its last 10, while the Canes have limited opponents to 2 regulation time goals or less in 4 of 6. Instead, the similarly low price on the Canes Team Total Over 2.5 makes this the stronger bet in our opinion. This looks like a pretty important game for both teams. New York’s looking to turn things around in its first game of a west coast trip after losing 4 of its previous 5, while the Kings desperately need 2 points pretty much every night in order to keep their flickering playoff hopes alive. If one team goes down a goal or two early, we can expect them to open things up a bit quicker than usual in order to try and come back, especially the Kings. The good news is that LA has a tendency to go down early in games. We’ve been playing a lot of first period moneylines against them at home because LA has been such slow starters in their own building (we cashed a Jets First Period +144 against them on Thursday night, for example). And New York’s a decent first period road team (we’ll actually have a bit on the Rangers first period moneyline +115 ourselves), so if the Rangers can get on the scoreboard first, look for LA to come out of its usual defensive shell. 5 is obviously a key number in Over/Under, and it’s interesting to note that the Rangers’ last 8 games have had at least 5 goals scored in them. New York’s allowed 3+ goals in 5 of its last 7 games, while scoring 3+ themselves in 5 of 8. The Kings have consistently allowed 2 or more goals (9 of their last 10 games), so it looks like the LA offence is the biggest of our worries here. Fortunately, the Kings’ power play is red hot, going 12 for 36 in their last 10 games, while the Rangers’ penalty kill is struggling (10 PPG against in their last 8 games). Combine all of those factors, and 5 at -115 juice looks like too low of a total for this matchup tonight. Reasons to bet Vancouver: The Canucks have scored 8 goals in their 2 meetings with the Wild this season. Minnesota has lost 6 of its last 7 games and 8 of 10, allowing 3+ goals in 8 of their last 9. Reasons to bet Minnesota: The Wild is 24-11-1 at home while the Canucks are 11-22-3 on the road. Vancouver has allowed 4 goals or more in 4 of its last 5 games and 5 of 7. Reasons to bet Philadelphia: The Flyers have won 3 of their last 5 games and scored 3 goals or more in 4 of their last 6 outings. Columbus has dropped its last 2 games and been held to 2 regulation time goals or less in 4 of its last 5. Reasons to bet Columbus: The Blue Jackets have won 9 straight home games versus Philadelphia and 12 of the last 14 meetings overall. The Flyers have lost 18 of their last 23 road games. 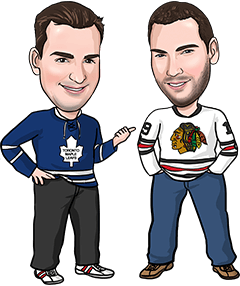 Reasons to bet Toronto: The Leafs are 7-1-1 in their last 9 games, holding opponents to 2 goals or less in 8 of those 9 games. Buffalo has lost 5 of its last 7 at home and 11 of 15 overall. Reasons to bet Buffalo: The Sabres have allowed just 7 goals in their last 4 games after giving up 21 in their previous 5. Toronto has lost 20 of its last 26 visits to Buffalo. Reasons to bet Boston: The Bruins have won their last 4 visits to New York. The Islanders played an overtime game last night in Pittsburgh and are playing their 3rd game in 4 days. Reasons to bet New York: The Islanders have won both meetings with the Bruins this year, scoring 4 goals in each of them. Boston has lost 4 straight games, getting outscored 20-11 in that span. Reasons to bet Ottawa: The Senators have earned points in 8 of their last 10 games (6-2-2). Montreal has lost 8 of its last 11 home games. Reasons to bet Montreal: The Canadiens have won their last 7 games following a loss at home by 3 goals or more, and 10 of 11 overall following a loss of 3+ goals. The home team is 5-0-2 in the last 7 meetings. Reasons to bet Calgary: The Flames have won 5 of their last 7 road games and 12 of their last 15 overall. Reasons to bet St. Louis: The Blues have won 9 of their last 10 games, allowing 1 goal or less in 6 of those 10 contests. Calgary has lost 3 of 5 since its 9-game winning streak, and has lost 7 of its last 8 visits to St. Louis. Reasons to bet Chicago: The Blackhawks have won 9 of the last 10 meetings and are on a 6-0-1 run in their last 7 overall. Florida has lost 8 of its last 11 home games. Reasons to bet Florida: The Panthers have been outshot just twice in their last 10 games. Chicago has scored 2 regulation time goals or less in 5 of its last 9 games. Reasons to bet Arizona: The Coyotes have allowed more than 3 goals just once in their last 7 games and twice in their last 10. Washington has allowed 2+ goals in 8 of its last 9 games. Reasons to bet Washington: The Capitals have scored 4+ goals in 3 of their last 5 games, going 4-0-1 in that stretch. Washington has recorded 40+ shots in 3 of its last 5 games, while Arizona has allowed 3+ goals in 5 straight. Reasons to bet San Jose: The Sharks look to avenge a 3-1 loss at home to the Predators earlier this month, and should be hungry to snap their 5-game losing streak. Reasons to bet Nashville: The Predators have won 5 of their last 6 games and are 6-1 in their last 7 at home. San Jose has lost 9 of its last 10 trips to Nashville. Reasons to bet Colorado: The Avalanche has actually been scoring goals lately, netting 3+ in 5 of its last 9 games. Edmonton has allowed 4 goals in 4 of its last 5 games and 3+ in 7 of its last 10. Reasons to bet Edmonton: The Oilers have scored 7 goals in 3 of their last 6 games, including a come-from-behind 7-4 win Thursday in Colorado. The Avalanche has given up 22 goals in its last 4 games.